Epigenetics and Diet May Determine Who Becomes Queen Bee | What is Epigenetics? Swords and stones might determine royalty in England, but scientists discovered that in honeybees, the deciding factor may be epigenetics. A recent study suggests that histone modifications, including histone methylation and histone acetylation, could determine whether bee larvae develop into workers or a queen. Interestingly, the bees’ diet was found to influence these epigenetic marks. Diet can have a significant impact in human epigenetics, and could influence a person’s disease risk and mental ability. “Think of the genome as the instruction book of everything that is possible but the epigenetics is the way in which those instructions are read. 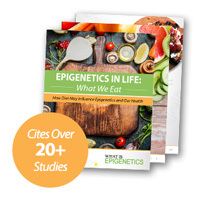 Epigenetics is about interpretation and of course there are many different ways to interpret these instructions and when and in response to what,” explains Dr. Paul Hurd of Queen Mary University of London. In a study published in Genome Research, researchers from Queen Mary University of London and Australian National University looked at histone modifications early in the honeybee’s development and determined queen and worker bees each have characteristic patterns of histone modifications on their genomes. Histones are the proteins that DNA wraps itself around, and it is believed that chemical modifications to these proteins affect how genes are expressed. Histones can be modified in different ways, each way affecting how a genome is transcribed. For example, histone methylation occurs when a methyl group is attached to a histone, resulting in either increased or decreased gene expression, depending on placement of the methyl groups and how many there are. Honeybees are popular subjects for epigenetic research because bees are not only essential to their environment, they have all the same types of epigenetic marks humans do; making them helpful for understanding how certain modifications may work. Past epigenetic studies on bees have given insight into issues many humans face, such as memory loss and addiction. Honeybees are unique in the fact that while having the same DNA sequence, they produce three different organisms: workers, drones and queens. According to past studies, this determination is made early in the bee’s life and can also be dependent on what diet the bee larvae are fed. In this study, the researchers wanted to elaborate on how diet directly impacts the presence of histone modifications, and how they affect the expression of the Queen gene. Queen bees are made by being fed royal jelly, a substance produced by other worker bees. This substance is potent enough to change the bee’s epigenetic makeup. The study suggests that while all worker bees are born with the genetic ability to become queens, the workers’ diet affects histone modifications that suppress that ability. This is the first study which the researchers describe as “the first genome-wide maps of chromatin structure in the honey bee.” Researchers collected eggs from worker and queen bees and sampled the larvae 96 hours after hatching. What they found was extensive differences in histone modifications, specifically at locations H3K4me3, H3K27ac, and H3K36me3, which can influence whether a bee becomes a worker or a queen. This study carries important implications for the environment. In recent years, studies have shown U.S. honeybee populations have dropped at an alarming rate and since they are such a vital part of the ecosystem, figuring out why this is happening and how to stop it is becoming essential to environmental survival. Some scientists believe more research is still needed to definitively prove that histone modifications can cause altered gene transcription in the honey bee, because this study did not test the effect that altered histone marks had on changing gene transcription and expression. Because honeybees have all of the same epigenetic marks found in humans; the findings in this study provide crucial insight to scientists with the hopes of better understanding the human epigenome. Reference: Shawna Williams. “As Bees Specialize, So Does Their DNA Packaging” TheScientist. 11 Sep 2018. Web.